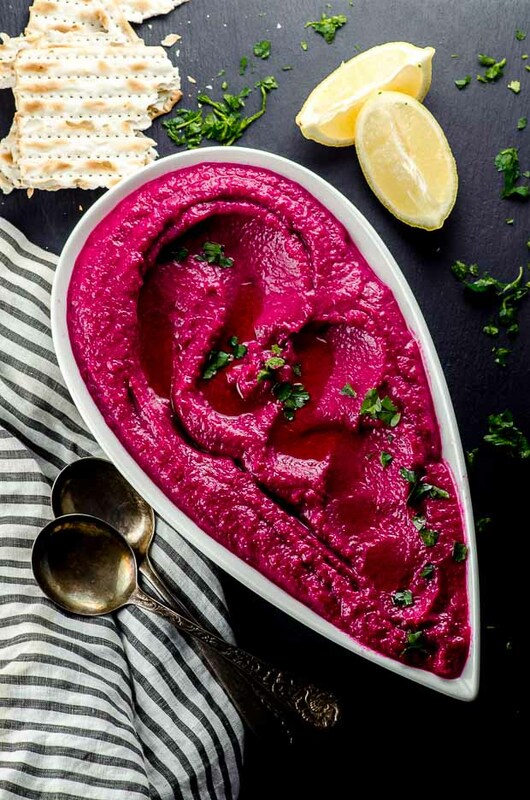 Colorful, creamy and cuminy/lemony, this cauliflower beet dip is perfect for a light lunch or dinner, as an appetizer, or an indulgent midnight snack. 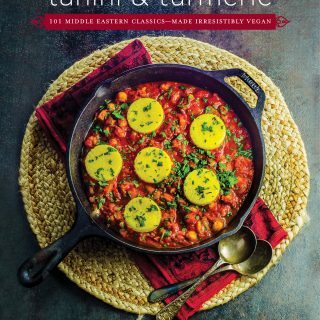 Vegan and Passover friendly! There is something about colorful food that’s fun to look at – it makes it even more fun to eat! 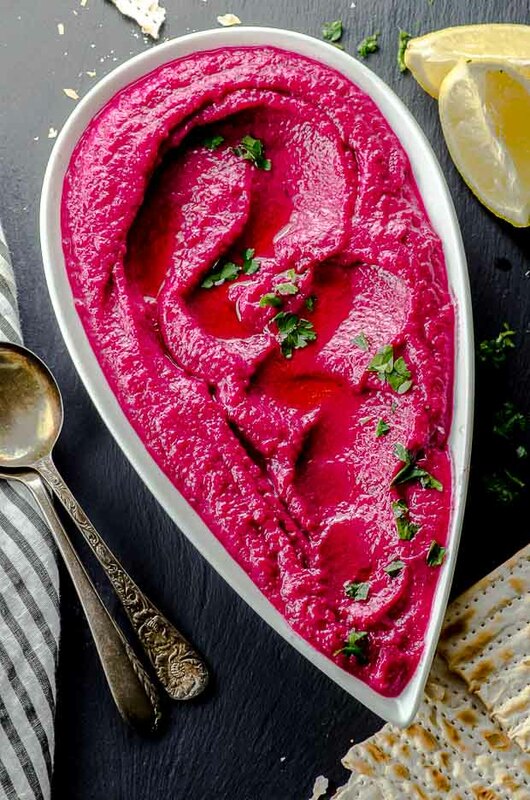 Our colorful, cuminy/lemony cauliflower beet dip is no exception, and it’s simple to make all year round! 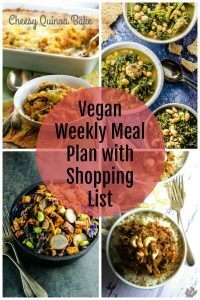 A perfect complement to veggies, bread, and crackers (or matzah), all you need is a food processor, some imagination, and an empty belly. 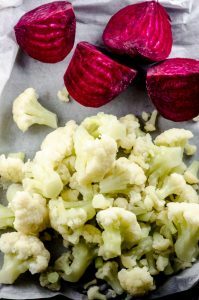 The pairing of cauliflower and beets in this dip is pretty marvelous, if we say so ourselves. 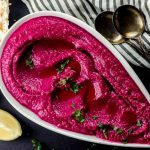 Beets in particular are a fantastic source of nutrients like fiber, folate, and Vitamin C. And that fabulous magenta pigment? Bet you didn’t know that it lowers blood pressure and can improve athletic performance. 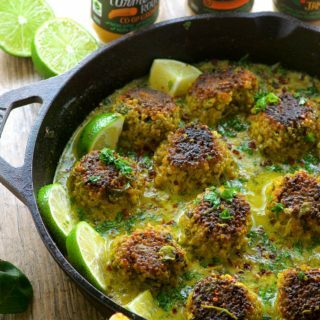 Cauliflower has become a trendy vegetable in recent years – you might have seen them chopped into “steaks” – but it’s long been a favorite of veggie fans who love its satisfying crunch. It also happens to improve eyesight, provide antioxidants and phytonutrients, and has choline, which helps with learning and memory. (Just saying.) 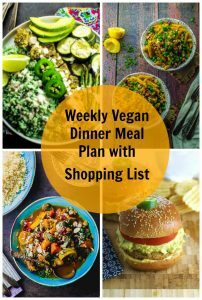 It also happens to be a particularly versatile vegetable, perfect raw, steamed, mashed, or, in this case, processed into a delectable dip. This version of our cauliflower beet dip is actually a “take two”. “Take one,” which we made by roasting the veggies and garlic on a baking sheet, got a little too toasty and had a slightly bitter taste. were craving. Trust on this one: we made the mistakes so you don’t have to! 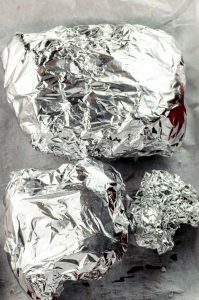 Wrap the cauliflower, diced beets and garlic cloves in aluminum foil, separately (so you have 3 separate little packages). Place them on the baking sheet, and roast until the beets are tender. 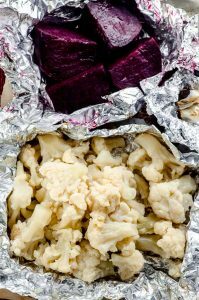 Combine the roasted cauliflower, beets and garlic and the rest of the ingredients in the food processor. Process until smooth and done! 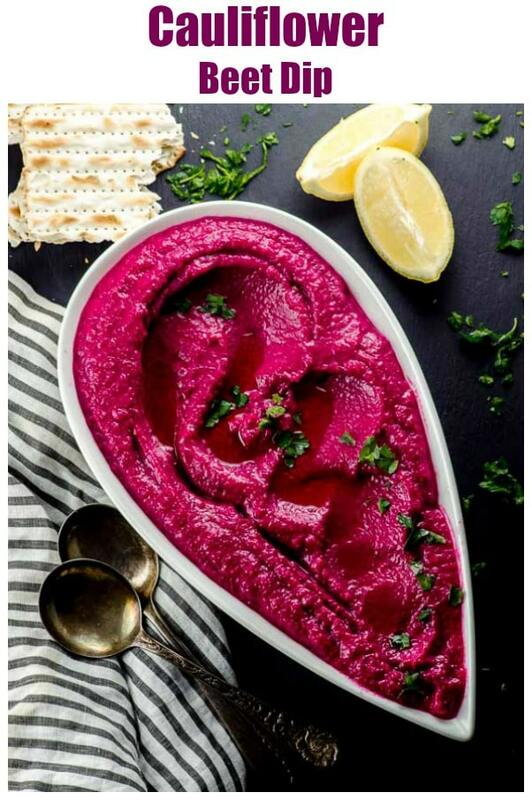 Aside from the fact that this dip is vegan and Passover-friendly, it makes for great presentation with just a little extra effort. For color contrast, pair it with bright red-pepper Romesco dip (click here for the recipe) on a vegan (or dairy, if not vegan) cheese board for a real crowd pleaser that appeals to both the eye and the palette. The combination of savory dips, smoky non-dairy cheese, the salty crunch of maltzah and nuts and the sweetness of the fruit are pitch perfect for a light lunch or dinner, an appetizer, or an indulgent midnight snack. 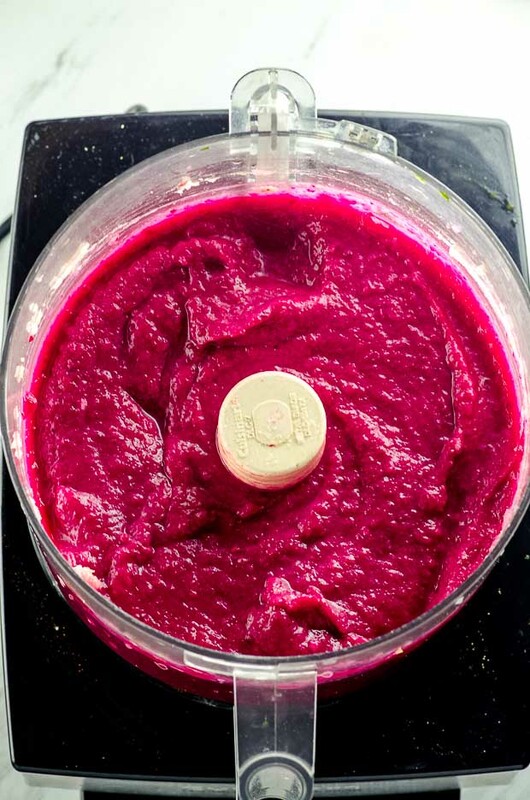 Did you like this cauliflower beet dip ? Leave us a rating! Did you love it? Share it or leave us a comment on Twitter or Facebook! Wanna see more? Subscribe to our blog and remember to follow us on Pinterest! Sounds delicious! Two questions, can you use fresh cauliflower and is the 1/4 lemon juice a quarter of a cup? 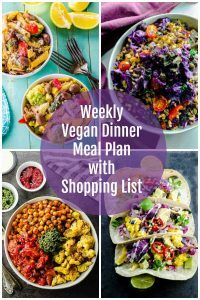 S couldn’t wait to make this recipe and it fulfilled all my anticipations! Beautiful colour and the combination of flavours is gorgeous. 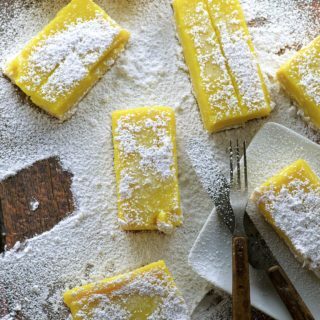 Took half to a friend along with a jar of horseradish and a couple of lemons as those ingredients were missing from my pantry. Also found some fresh horseradish so we’ll have fun experimenting perhaps. 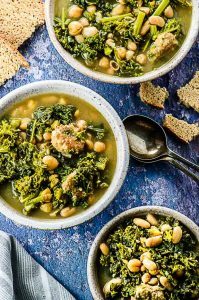 Thank you for this recipe, I could eat it by the spoonful from the bowl on its own. So good. This dip was absolutely delicious! And the color intense magenta is a stunner. 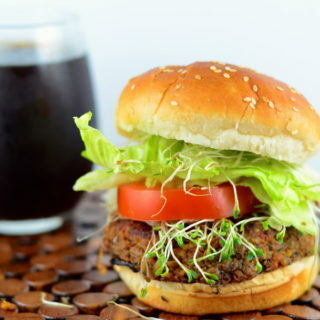 It goes together easily and can be made the day before. I served it with Yehuda Gluten Free Matzah, which is crispier than regular matzah, giving a contrasting crunch; My guests loved it. It will be a regular on my holiday appetizer table. Thank you! 5 stars!